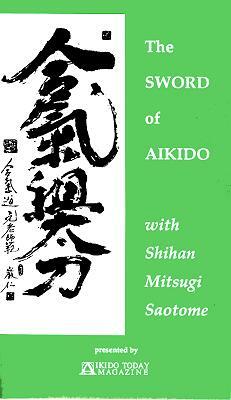 A friend showed me the video 'the sword of aikido' by Saotome sensei (Mitsugi, not Genma :). The tape shows a number of suburi and kumitachi (paired sword partner practice). The tape starts with a few short bits of footage from Ueshiba Morihei, and an introduction to Saotome's organisation. 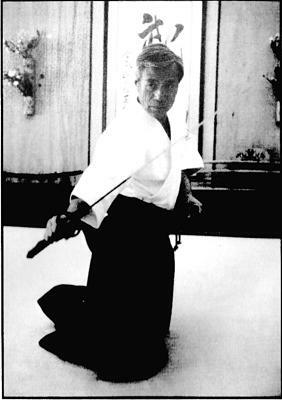 The intro says that Ueshiba Morihei didn't give systematic instruction in the use of the sword, and that the techniques on the tape are more or less a creation of Saotome sensei. Unfortunately, it does not mention his sources, if any. I've read that Ueshiba did have at one point a fairly concrete ken and jo syllabus, which Morihiro Saito seems to have preserved; maybe I misinterpreted the narration. There is a kind of weird iai demo at the end, but I didn't recognise the noto or to rei. Also shown is a brief flash of some funny nito technique. There is almost no info on the reasons for the kumitachi and how they relate to aikido, except for a single 'this kumitachi teaches not to overcommit a strike' remark. From watching the tape, I did not 'get' the vision of Saotome sensei, what aikido principles exactly these kumitachi are supposed to express, or why they would express them better than, let's say, the kendo kata. In this respect I felt the tape a bit lacking. 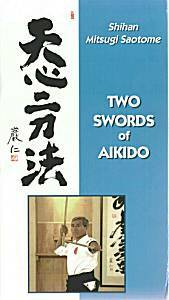 In some other 'aiki sword' I saw, the principles are very obvious (like, this teaches irimi, that teaches tenkan, etc. ), but this is not the case on this tape. The tape is virtually essential for individuals who train in Saotome Sensei's system, as the first five forms are required for shodan testing and the rest are required for nidan testing, but I see little reason why anyone else would want to do these kumitachi (+convince a second person). There are 5 kumitachi explained, with variations, and some ten others are demonstrated. It would be interesting to know what ryu were used to assemble these kumitachi and why. From a swordsmanship point of view, there is a huge difference in skill apparent between Saotome sensei and his partners on the tape. 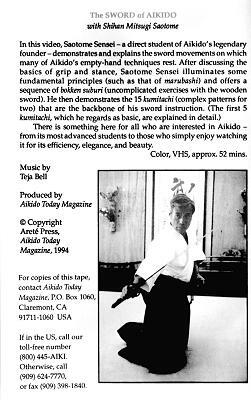 I got a few comments from people who take aikido at a Saotome-sensei-affiliated dojo and practice the kumitachi shown on the tape, which seem to indicate that his high-ranking students' sword work is rather unimpressive. According to these same people, the kumitachi were taken in part from Saito-sensei's collection. The "official" claim is that Saotome Sensei, like others of O-Sensei's uchi- deshi, has systematized the (supposedly chaotic) instruction he received. Since my friend keeps buying Saotome's tapes, I'll offer some more of my uninformed opinions. This tape has a part showing basic moves, a part explanation by Saotome sensei (his English is a bit hard to follow, if I am misrepresenting his explanation, it is not deliberate), and a taped seminar. 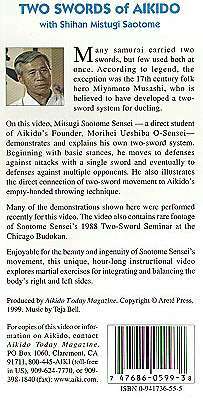 On this tape, Saotome sensei explains the rationale behind his weapons training: it forces students to focus on technique since weapons preclude the use of physical force. The purpose of his two-sword techniques is to train both sides of the body. The actual techniques were based on a TV series about Miyamoto Musashi (!). 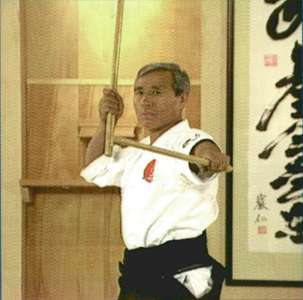 They do not, however, resemble Hyoho Niten Ichi Ryu two sword techniques. I found the basics difficult to follow, because when Saotome demonstrates a stance, there is no indication of the opponent's position ( it seems to be on varying angles from the camera, but that could be me trying to map them on NIR nito kamae). 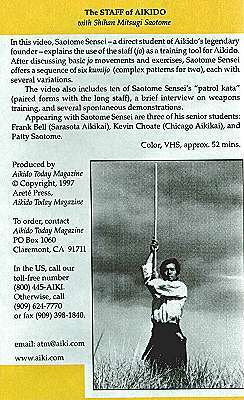 Like the other Saotome tapes I saw, this one seems to be of limited interest for people outside of the "Aikido School of Ueshiba." A few peculiarities I noted: Saotome sensei is always in the "nage" role, never "uke." Also, after each technique, "uke" keeps his ground while Saotome sensei steps back. Saotome sensei seems to like walking backwards a lot, I noticed the same in his randori section, it looks very strange. I never understood much of jo use in Aikido until I realised most of what I saw was misogi-no-jo and not something remotely related to combat. This tape starts with Saotome sensei poking mostly towards the ceiling and otherwise scaring off the spooks. The rest is mostly kumi-jo patterns (using the longer 'aiki-jo') and several "patrol kata" using a bo.